This is a version of an editorial written for the Journal of Documentation. The future of the book has received a good deal of attention, as we move into an increasingly digital information environment. The e-book has become a reality, and the prospect of books being superseded entirely by blogs, wikis and other novel digital formats continues to be touted. 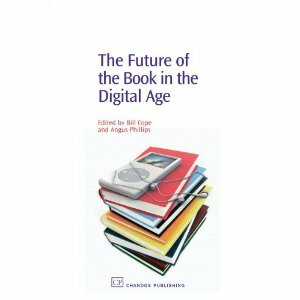 The current status of, and future prospects for, the traditional book format have been analysed by authors such as Cope and Phillips (2006), Kovac (2008) and Thompson (2005, 2010). Volume V 1914-2000 23 chapters, 611 pages. The series consists of reprints of selected essays, journal articles and book chapters, chosen from materials published over several decades: in volume I, for example, the dates of the contributions range from 1958 to 2005. The series is therefore inevitably subject to the criticisms that can be ranged against all of its kind: that coverage is selective and partial, and potentially subject to the interests and perspectives of the editors; that material chosen from such a wide time period is liable to be outdated in some respects, and perhaps even self-contradictory; and that there is style or voice for the collection as a whole. While such criticisms are undoubtedly valid, in this case I feel they are entirely outweighed by the advantage of having such a range of scholarship in a single source. And, pace the enthusiasts for the e-book, there is something very satisfying about having the collection as 22cm. of nicely produced browsing material on the bookshelf. Not that I would not like a digital version as well, particularly for ease of lookup since the volumes have only name indexes; an understandable, though regrettable, limitation. It is also possible to criticise the series on the grounds that it deliberately excludes consideration of the book in other cultures than those of ‘the West’ – essentially Europe and the USA – and also does not deal with the information-bearing objects of pre-history and the ancient world before the series start date of 400AD. Again this would be unjustified quibbling; the editors have done well enough to cover the wealth of material within their agreed boundaries. The first volume attempts what the editors describe as the “difficult, not to say impossible, task” of choosing a small number of essays to cover the development of the book from throughout the medieval period, from later antiquity to the early developments of printing. They emphasise the development of the of classical world’s codex into the standard form of a book, suggesting that the book as we know it did not appear suddenly with the advent of printing; all the features of the modern book – pagination, illustration, standard type faces. Indexes and so on – were present in the medieval codex. ‘All’ that printing did was to make possible the simultaneous production of multiple copies of identical texts. Volume two covers the development of the book from the introduction of printing in Europe through the 16th and 17th centuries; the editor describes the selection of the essays here as “a Sisyphean task”. The largest section here deals, not unreasonably, with the impact of print, with others on typography, printing practices, selling and reading. The next volume, which covers the eighteenth century, takes a refreshingly broad scope, with a section on newspapers and other periodicals, and several chapters on libraries and on reading in different contexts. As the editor points out, this century saw little, if any, advance in printing technology, but rather witnessed such developments as the emergence of the central role of the publisher, the initiation of a copyright system in the modern sense, the beginnings of modern distribution systems, and the growth of periodical literature. Volume four covers the period 1800-1914, the ‘long nineteenth century’ in the aftermath of the industrial revolution, when, as the editors say “the printed word became ubiquitous [as] the processes of book manufacture and distribution were revolutionized and the market for books grew as education improved and population increased”. This period, which laid the foundation for the systems of information communication which persist to the present day, is covered by contributions categorised into sections on national publishing structures, international trade, publishing practices, distribution and reading. It is perhaps a pity that the development of library systems is represented only by a chapter on reading rooms for African Americans, and that the growth of the scientific monograph and journal literature is barely mentioned. The fifth and last volume brings the story up to date, or at least to the close of the second millennium, taking a broad-brush approach with contributions on intellectual property, the impact of television, the effects of war and censorship, libraries, bookclubs, and bookstores. There is however almost no mention of the great changes in scientific and technical communication over the period. The final section, dealing with digital books, comprises three items, one a reprinted chapter from Cope and Phillips (2006). The editor points out that, although the scope of the chapter precludes coverage of the significant developments of the early 21st century, their roots lie in earlier developments which are covered: new design and typographical technologies, extension of copyright to new forms, redefinition of a book as both material object and electronic format, etc. To understand where we going, in the development of the book as much as in any other aspect of information and documentation, we need to know where we have come from. As numerous contributions in this series show us, the seeds of the information future are already present, if we can recognise them. Browsing through these splendid volumes should spark off as many ideas about the future of the book as focusing on futurology.